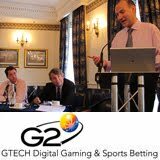 GTECH G2’s second Thought Leadership Seminar brought industry leaders and legal experts together this week to discuss the ramifications of proposed changes to UK gambling policies resulting from the current Remote Gaming Review. The CEOs, legal advisors and other igaming executives that attended left better prepared to voice their concerns during the government’s Consultation process. The expert panel, with moderator Peter Wilson, Partner, Memery Crystal, features Simon Burridge, CEO, Virgin Games; Paul Bolt, Director of Sport and Leisure at the DCMS (the key civil servant responsible for gambling); and Nick Hawkins, Legal Director & Company Secretary, Danoptra; and James Hollins, Gambling Equity Analyst, Daniel Stewart. “It was a well informed and open debate about the Consultation proposals,” said moderator Peter Wilson. “Despite what quickly appeared at the start as diametrically opposed camps of Simon Burridge, Nick Hawkins and James Hollis from the industry on the one part, and Paul Bolt representing the Government on the other, some common ground emerged. First, there is not any specific consumer protection problem with the current licensing system that needs fixing. Secondly, the proposals were the product of the DCMS feeling it needs to be “seen to be doing something” in the face of an ongoing erosion of an already comparatively small number of operators holding British remote licences. They are certainly not industry driven reforms. Thirdly, an intention to require overseas operators in the EEA, white list territories or Gibraltar to apply for British licences that is intended to be enforced by a law without extra jurisdictional effect would largely be relying on operators’ goodwill to apply for the necessary licences. The US experience was cited as a clear example that not all operators will fall into line. Finally, all were in agreement that, as always, tax will be the most important element. With Paul Bolt unable to advise us of the Treasury’s plans (which frankly even the Treasury probably couldn’t throw much light on as yet), there was, as Nick Hawkins put it, an elephant not just in the room but filling it. No one had sufficient crystal ball reading skills to foresee whether the proposals would survive the election of a new government but there is no doubt from the main 3 parties’ manifestos that remote gambling is neither high on the political agenda nor held in high regard. Paul was refreshingly spin free as a government representative and remained unflappable in the face of wide ranging criticism of the proposals, articulated well by Simon. Video highlights, photos and additional information are available at www.iGamingDebate.com. GTECH G2 hosted, but did not take part in the debate directly. GTECH G2 supports regulated markets where jurisdictions license operators serving the residents of that country. GTECH G2’s Thought Leadership Seminar series is part of the casino, poker, bingo and sportsbetting software company’s commitment to furthering dialogue and understanding of issues and industry developments that are critical to its business partners’ success.